Are you craving Chanel, but don’t want to pay full price? eBay is one website where you can score authentic Chanel via the internet, and for a limited time only check out YOOX (dot com), they just got in a piece or two of authentic (and in good condition) Chanel. The Chanel listed above is the one that caught my attention the most. It has so many classy details I just love about Chanel. First of all, this Chanel is made out of smooth quilted chocolate brown nappa leather, (dark brown being a nice substitute for a solid black leather bag). Chanel’s signature logo closure was also applied to this bag, a detail I truly adore. Something that isn’t really appealing to me would have to be the single nappa leather strap; it seems so boring, in my opinion. I most definitely prefer Chanel’s classic metal and interwoven leather chain straps. 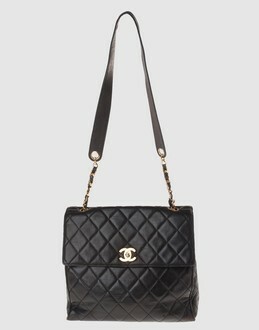 It seems like Chanel was starting that chain and leather strap feature on this bag, but never finished! As I mentioned before, this bag is not brand new, instead YOOX’s claims it is in good condition. If you are interested in this Chanel, make sure you read up on its specific flaws before buying. Although, something in the back of my head is saying, “Who cares… its CHANEL”! wow.... it's cute but it's sold for insanely price of nearly 3.5k!!! ^^^NO... actually it's on sale at YOOX for $1,920!! this bag is alright. and for the price, i'd spend the extra $500 or $600 on a classic flap. jmo though. ITA. rather get a new bag for that price.